A MASSEY HARRIS Tractor Operator & Service Manual PDF is above the page. The first joint brainchild of the Massey Harris was the reaper-thresher, the mass production of which was launched in 1910. The peculiarity of the machine was that in just one operation it mowed, threshed, cleaned the crop and delivered it to the grain bunker, demonstrating an unprecedented result harvesting - up to 6 ha per day. But most importantly, this invention was an important step towards an event even more significant for the entire industry - the emergence of the world's first self-propelled combine in 1938. The new machine, which received the serial number MH 20, did not require the use of tractors, much less horses, which was a real revolution in harvesting. At the same time the term "combine" appeared. Three years later, Massey-Harris refined its idea by releasing the MH 21 model. It was not only produced with two sizes of reapers, it became lighter and more compact, but also significantly cheaper, which subsequently made it the world's best-selling combine. However, one should not underestimate the contribution of Massey-Harris to the field of tractor construction. The company became one of the first firms to launch a four-wheel drive tractor into mass production. Although real success and recognition to Massey-Harris came in this area after the acquisition of the British company Harry Ferguson Ltd, founded by engineer Harry Ferguson. After the merger in 1953, the newly formed company was named Massey-Harris-Ferguson. 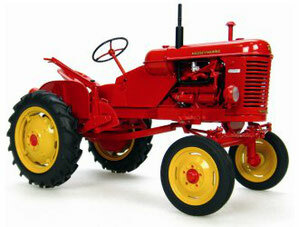 But later, in 1958, the name was shortened to Massey Ferguson. Despite the fact that the name of the third founding father of Alenson Harris did not remain in its modern name, the memory of him is carefully preserved in the brand’s symbolism - the three triangles that mark the legacy of Daniel Massey, Harry Ferguson and Alenson Harris.